Would you like to be the lucky owner of a Goldmember license? This license will give you unlimited access to all our software for free, for life, even for our upcoming programs not yet released!!!! Then enter our contest and you may win one of the 5 Goldmemberships we’re giving away! At VSO, we do have a lot of DVD and Blu-ray players for testing purposes. 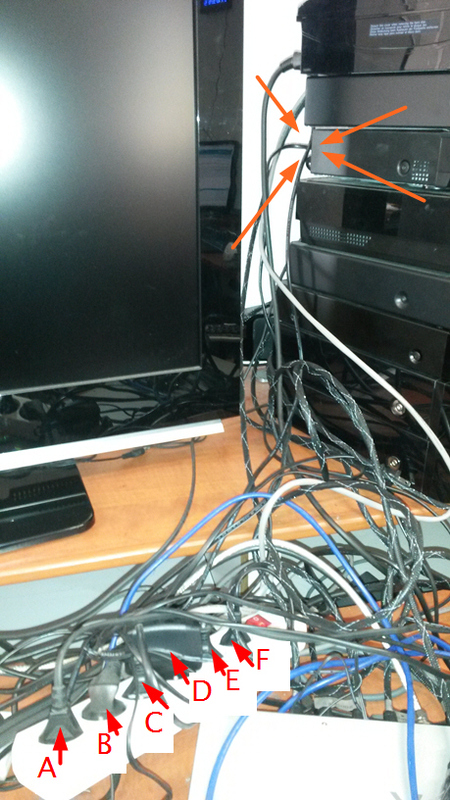 And as you can see from the picture below, we may not have the most organized and neat “plugging”system. The question is simple: there are 6 plugs on the rack. Which one connects to the player highlighted with the arrows (third down from the top)? A, B, C, D , E or F? The contest is now over. the right plug was E! We’ve handpicked 5 winners that gave the correct answer and sent them a VSO Goldmembership (worth 199.99$!). Congratulations to Adam, Jason, David, Vid and Franck! Stay tuned for a new contest soon! Previous PostBest TV shows of 2016: our pickNext PostHow to stream a video (and download it), the ultimate guide!